Thank goodness you are now able to get some decent coffee with all that gorgeous patisserie! From my one visit to France, the patisserie’s remain my very favourite thing. My other would be the fantastic potato preparations I enjoyed whilst dining out, be it frites, puréed or some other way. And lentils and duck and….I will stop there. I’m with you Mel all the time,efficient over fake friendly wins the day. There’s nothing worse than the “Have a nice day” that’s said by someone who isn’t even looking at you and is said in such a bored way you know it’s an automatic reaction that’s part of the training. Not a sincere word in sight (so to speak). Having said that, I think interaction is fine since it shows the waiting on staff that they’re recognised as individuals.No doubt I’m spoiled by the attention I get where I eat but at the end of the day, it’s why I eat there. I’ve allowed friendships to develop so that I’m a friend rather than a customer.I think I’m more comfortable like that. is it still not ok to order a cappucinno after hours at the boulangerie-pâtisserie places you mentioned? or does the unspoken law of not ordering cappucinno in the afternoon still applies? Oh dear…I am not aware of any rules regarding times for ordering cappuccino! Only café au lait, which is a breakfast drink for the French. But none of the bakery cafés will be open after about 7pm anyways! lol, i think i have my leg pulled. i read in a blog that if u order a cappucinno anytime other than at breakfast you will get scorned by the waiter and be told off . 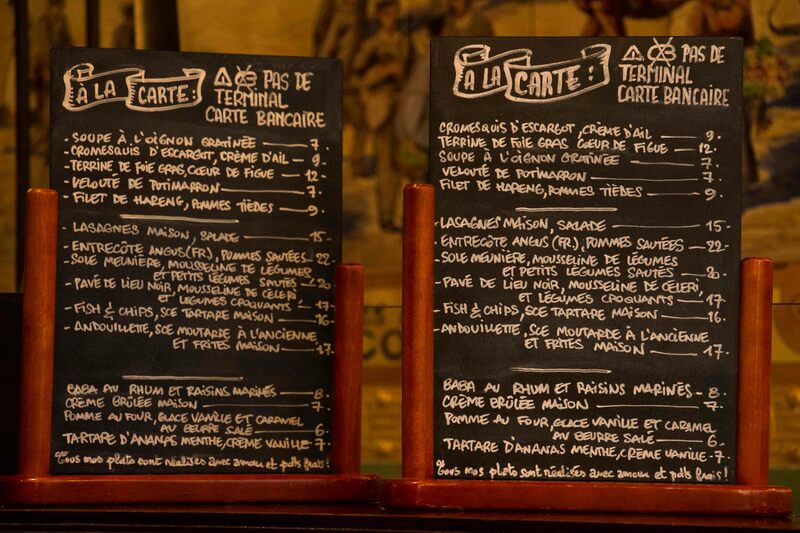 Great article – number four made me nod my head 🙂 I’m a real meanie, but what I enjoy the most about french restaurants (apart from the food) is the English translation of the menu. Last weekend I ended up crying with laughter and was inches from being frogmarched outside by my girlfriends. Oh, that’s terrible. I would never do anything so crass as to laugh outright at the poor French! 😉 Tee hee. We should not fear le beurre! Oh, yes, butter is better….although a little moderation never hurts, along with copious amounts of red to wash it down! Agree, Mélanie! Rewarding good service with an appropriate tip is always a good idea. Personally, I tend to overtip compared to my French friends, so 2-3 euros sounds perfectly correct. Cheers for that! So glad it was helpful! Personally, like most French laws, I find the intention is good but the execution backward. Why oblige restaurateurs to post an ‘authentic’ label next to home-cooked meals – it would make more sense and be more transparent to have those who use frozen or prepared foods have to disclose this on their menus!